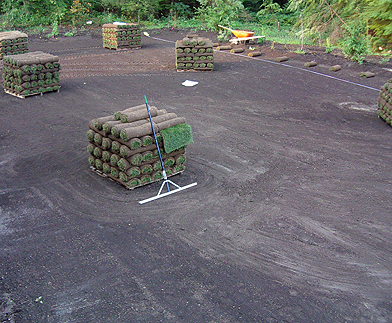 LANGLEY/ABBOTSFORD/ALDERGROVE SOD / TURF FARM SUPPLIER AND INSTALLER. Get pricing and order online. We provide turf / sod rolls for great looking residential lawns, sport fields, golf courses and commercial sodding projects in Langley, Fort Langley, Aldergrove and Abbotsford. Campbell Valley, Fort Langley, Brookswood, Bradner, Mount Lehman, Townline Hill, Clearbrook, Sumas Mountain are all areas we service in Langley and Abbotsford. Your sod order will be shipped on pallets. Be sure to lay your new turf as soon as possible, preferably within 24 hours of receipt. During warm weather sod that has been rolled up may start to turn yellow. The sod farm normally harvests the evening before shipping. The sod farm is located in Abbotsford and in Langley during the summer months. Your local turf farm supplier in Abbotsford, Langley and Aldergrove.